Nortech is an award winning Engineering Design, Project Management, Procurement and Construction Management services provider. __utma, __utmb, __utmc, __utmz: These cookies are used to store information, such as what time your current visit occurred, whether you have been to the site before, and what site referred you to the web page. These cookies contain no personally identifiable information but they will use your computer's IP address to know from where in the world you are accessing the Internet. Google stores the information collected by these cookies on servers in the United States. Google may transfer this information to third-parties where required to do so by law, or where such third-parties process the information on Google's behalf. By accessing and continuing to use this website users acknowledge and undertake to comply with this disclaimer. Nortech Group retains the right to amend this disclaimer as and when it deems appropriate without notice. Nortech Group endeavours to ensure that the data and other material in this website are correct and complete, but does not accept liability for any error made or omission from this website. The development of Nortech Group products and services is continuous and published information may not be up to date. It is important to check the current position with Nortech Group. To the extent permitted by law, Nortech Group disclaims all warranties, express and/or implied, as to the accuracy of any information contained on this website. Nortech Group shall not be liable for any claims or losses of any nature, arising indirectly or directly from use of the data or material on this site, neither is it responsible for damages or losses caused by any delays, defects or omissions that may exist in the services, information or other content provided on this website, whether actual, alleged, consequential or punitive. All contents of this website and any downloads thereof are owned directly by Nortech Group or indirectly through one of its subsidiaries unless otherwise stated. All rights reserved. Nortech Group, Evolutions 6B, Wynyard Avenue, Wynyard Park, Billingham, TS22 5TB. You are responsible for obeying all copyright laws and we permit you to make copies of this website as necessary incidentally acts during your viewing of it; and you may take a print for your personal use of so much of the site as is reasonable for private purposes. All other use is strictly prohibited. Nortech is a trademark of Nortech Group and you may not frame this site nor link to a page other than the home page without our express permission. Neither Nortech Group nor any of its subsidiaries are responsible for the content or any other website, including through which you may have gained access to our website or to which you may gain access from our website. Where we provide a hyperlink to a third party's website, we do so because we believe in good faith that such a website contains or may contain material which is relevant to that on our website. 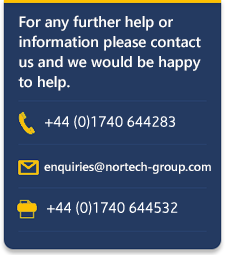 Such a hyperlink does not signify that Nortech Group or its subsidiaries have reviewed or approve of the connected third party's website or its contents and in certain instances a hyperlink may connect you to a third party's website containing views contradictory to those expressed on our website or otherwise held by Nortech Group and its subsidiaries. You acknowledge and agree that all proprietary rights in the information received shall remain the property of Nortech Group. Reproduction, redistribution and transmission of any information contained in the website is prohibited. Nortech is committed to ensuring that all aspects of its website are accessible, and compliant with the Disability and Discrimination Act. If you have any comments or questions about Nortech's approach to accessibility, please email the Webmaster.